In Hindu mythology, Nala and Damayanti were lovers who overcame various obstacles to marry and live happily. Their story appears in the Hindu epic the Mahabharata and in the Naiadhiyacarita, a poem written by the poet Shriharsha. According to legend, Nala was the young, handsome, and skillful king of Nishadha in central India. Damayanti, said to be the most beautiful girl in the world, was the daughter of King Bhima of Vidarbha, a neighboring country. One day Nala captured a swan. In return for freedom, the swan flew to Vidarbha and praised the virtues of Nala to Damayanti. After hearing about him, Damayanti hoped that he would fall in love with her. Soon after, Damayanti's father decided to find a suitable husband for his daughter and invited many princes to his palace. Several of the gods also sought her hand in marriage. On the way to the palace, the gods met Nala and told him to serve as messenger and announce their intentions to Damayanti. When he arrived at the palace, Damayanti marveled at Nala's good looks. Nala relayed the message from the gods, but Damayanti told him that she wanted only him and vowed to wed him or die. In Hindu mythology, Nala and Damayanti were lovers who overcame many obstacles to marry and live happily together. This colorful drawing shows their marriage. herself to Nala and began to pray. As she prayed the gods assumed their own forms. Damayanti chose Nala, and the two were married. Angered that Damayanti had married a mortal, the demon Kali vowed to take revenge and tricked Nala into gambling away the royal treasury. Having lost everything, Nala advised his wife to leave him. She refused. Kali lured Nala away from Damayanti. Nala wandered the world. During his travels, a Naga, or serpent god, changed Nala into Vahuka, the charioteer of King Rituparna of Ayodhya. Uncertain whether Nala was alive, Damayanti announced that she would marry again within a day. Rituparna sped with the charioteer Vahuka to claim her. When they arrived, Damayanti did not recognize the charioteer as Nala. Yet she suspected that the man was Nala because only he could reach her so quickly. After she questioned him, the charioteer changed back into Nala. 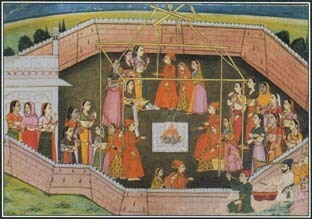 The two lovers were reunited and lived together in Nishadha. See also Hinduism and Mythology ; Indra ; Mahabharata, The ; Nagas . story is with too little details.Folk traditions' versions can also be consulted by this site.